Plans to give staff immediate access to dedicated mental health support will be considered as part of the upcoming workforce implementation plan. The government is setting out new plans to provide better mental health and wellbeing support to NHS staff. HEE made the recommendations in its report on the mental health and wellbeing of NHS staff and learners, commissioned by the Department of Health and Social Care last year. The recommendations will be considered as part of the ‘workforce implementation plan’, which will be led by NHS Improvement Chair Dido Harding and Leeds Teaching Hospitals Trust Chief Executive Julian Hartley. HEE spoke to staff whose wellbeing had been affected by their experiences in the NHS workplace, as well family members who had lost relatives through suicide. They also visited organisations that are already demonstrating good practice in supporting staff mental and physical wellbeing to understand how these initiatives could be rolled out across the NHS. The measures should help NHS organisations make positive progress on sickness absence rates, staff performance and retention. The latest NHS staff survey showed that less than a third of staff felt their organisation took positive action towards improving their health and wellbeing. I love the NHS and have enormous respect and admiration for the dedicated staff who make our health service what it is today. 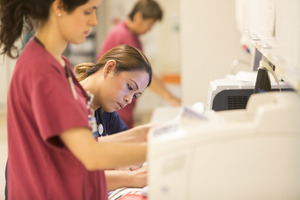 Working under pressure, NHS staff put themselves in some of the most challenging situations imaginable as part of their unwavering commitment to caring for us all. So they deserve unwavering support from us all. I’m so proud of the service NHS staff give, so the mental and physical wellbeing of the people who work in our health service must be our utmost priority. Today’s important report helps guide how we can do that, from creating the right culture of support to giving everyone somewhere to turn in the toughest times. NHS staff have been there for me, and they have been there for my family – so I’m determined to make sure we are there for them too. If someone is looking to join the NHS, whether through education and training, an apprenticeship or direct employment, they should be able to see and feel that the health service is bringing to life the statements expressed in the NHS Constitution. More support is needed for those who care and better care is needed for those studying to become healthcare professionals. This is why I am committed to making sure that the commission takes full advantage of this opportunity to make a real difference to the NHS health and care workforce and to those studying to become our future healthcare staff. It is vital that staff feel they are supported and that employers have the right procedures in place to offer all the help that may be needed. The mental wellbeing of staff contributes positively to patient care so we must get it right. As a caring and compassionate organisation, the NHS attracts staff with these values, but it must be recognised that in giving care you also absorb some of the concerns and issues of the people that you are caring for. We must do better for those in the caring professions. And we must care better for those studying to be professionals. This commission will make that happen.